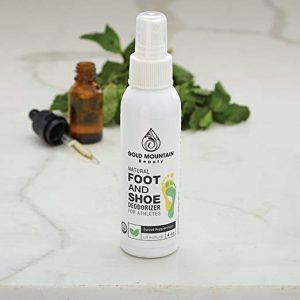 The shoe deodorant has a formula which is based on a variety of natural ingredients, including a variety of substances such as peppermint and eucalyptus oils. Coming together, the substances counter odors generated by the bacteria on your feet and in the shoes. It is alcohol-free, so it does not dehydrate the skin. Thanks to the use of only naturally-occurring substances, the harmful chemicals present in other products are not encountered in this one. This makes it safe to use even for those with sensitive skin or with various allergies and will allow you to use it together with your family and children too. It is paraben-free, and the bottles are not made of plastic materials which could alter the composition. Apart from being all natural and safe to use, the formula is potent and effective in repelling smell. It is meant to be efficient in a variety of situations, for people who are working long hours, for those training or practicing various sports and also for children who play a lot outdoors. It will replace tough odors with a sweet and enjoyable combination of peppermint and tea tree smell. Your skin health will be improved by using the spray, which works not only as an odor repellent but also as a skincare item. 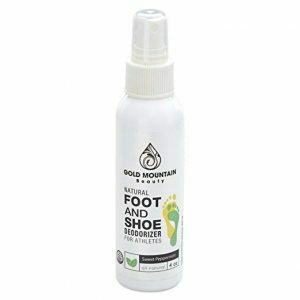 The vitamins contained in the formula will soothe the sore feet and will make the skin feel softer, giving you a refreshing sensation. Furthermore, when used regularly, it will eliminate the smell, especially if combined with a proper bathing and hygiene practice. Used daily, it improves the health of your skin and feet. 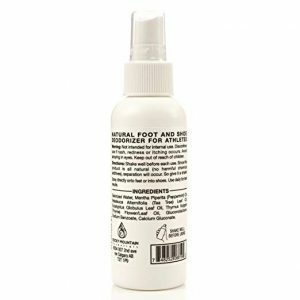 Unlike other products which only mask or partially remove the smell, this spray kills the bacteria causing the bad odor and, when used continuously, it eliminates the source of the smells. Its formula is gentle to your skin but hard hitting on the bacteria and fungus causing the discomfort. Eliminating these issues will offer you a better experience and more enjoyable days at work or on the training fields. By purchasing these effective deodorizers, you will support a family business which aims at offering great value for the money with its products. They take pride in providing you with only the best quality items, which are also affordable and accessible to find. Furthermore, the product is vegan-friendly and cruelty-free, as it is not tested on animals. Most people acquired the product for use on their gym shoes, and the general opinion is that it was efficient in countering the smell. It is so powerful that only a small quantity is needed to keep the odors under control, so you will be able to use one bottle for a more extended period. Furthermore, some customers have used it in many other ways: on a litter box, on the garbage pail, and for car or house interiors which smelled terrible. The value of the product and excellent customer service provided convinced some people to buy more of the same item.